Did one of your twins get invited to a party and the other didn’t? I’ve been there and from experience, I’ve developed three options on what to do when one twin gets invited to a party. One of the first things we encountered after deciding to separate our twins for preschool was a birthday invitation. An invitation that only one twin received because they were in different classes. This happened several times during the school year and in talking with moms of multiples I’ve learned it’s pretty common. After the very first invitation came I knew I needed a plan, especially for while they are younger. I came up with three options on what to do when one twin gets invited to a party that help me handle each invitation without any stress. The first option when one twin gets invited to a party and the other doesn’t is to do absolutely nothing. Life isn’t going to be equal and even for them because they are twins. Depending on the age of your twins when this happens, you can explain to them that just because they are twins they don’t get the same things. Let the other child know they will get invited to a party too so they can look forward to it. When you call to RSVP for the party ask the parent if it’s okay to bring the other twin along. If I do this I usually spend more on the present because I’m bringing two kids. Other times I offer to pay for the second child depending on the party setting. 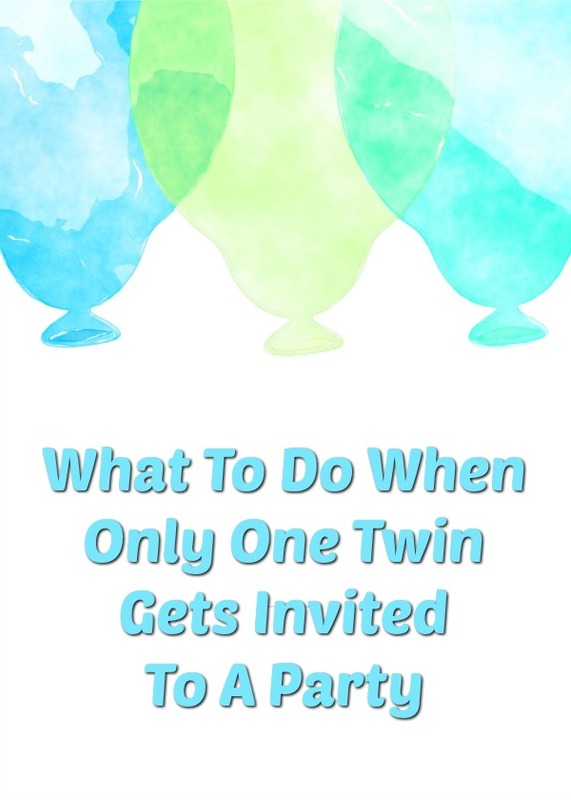 I previously shared ways we sneak in alone time with each twin and those ideas are super helpful when one twin gets invited to a party and the other doesn’t. One parent can take one of the twins to the party while the other parent does something fun with the other twin.